Repairs involving carpet ripples, tears, holes, or stains not only bring back your carpets aesthetic value, but it may also prevent further damage from occurring. Attempting to repair the damage personally may not be the best decision. Most people turn to professionals to repair their carpet for best results. Deciding if it is a project that can be tackled personally should be a no brainer if you do not have experience. However, there are a few easy ways to know if it is time for professional help. Hiring a professional may be more expensive, but consumers are paying for the education and experience of that pro. A carpet repair specialist has the knowledge and experience to tackle any repair job in front of them, saving you from the expense of new carpeting. There are also many specialty tools needed to complete the any carpet repair. Flooring can be a very expensive investment, and someone trying to fix a large tear, burn, stain or ripple can actually make the damage worse. Hiring an expert that knows how to repair carpet is a surefire way to protect your investment. If the carpet is insured, a DYI fix-it job may void your policy. The most common types of damage are loose carpeting, burns, tears, and stains. Less common types such as water or smoke damage, and normal wear and tear. A colored stain such as red wine can leave a permanent if not treated properly, and an animal urinating on the surface can add not only a discoloration, but a terrible odor that can be extremely difficult to remove. 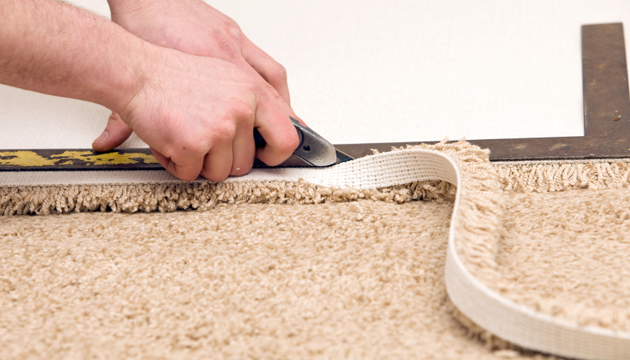 Attempting repair carpet damage yourself does not typically end with the best results. For a carpet repair specialist you can rely on, licensed and insured through the city of Riverside, CA contact us at 951-787-8787.